I’ve had a busy time, with a brilliant World Book Day visit to Teign School – read all about it on their BBC news site! – and a great workshop at Pilton Community College in conjunction with Barnstaple Library and Daisi, who promote ‘arts inspired learning’. Huge thanks to all the staff and students involved. Meanwhile, the next meeting of the Waterstones Newton Abbot book club is all planned out. Our book for April is Fortunately, The Milk by Neil Gaiman illustrated by Chris Riddell, and we’ll be discussing other Neil Gaiman novels too. Plus there will be general book chat, writing exercises, snacks and fun! 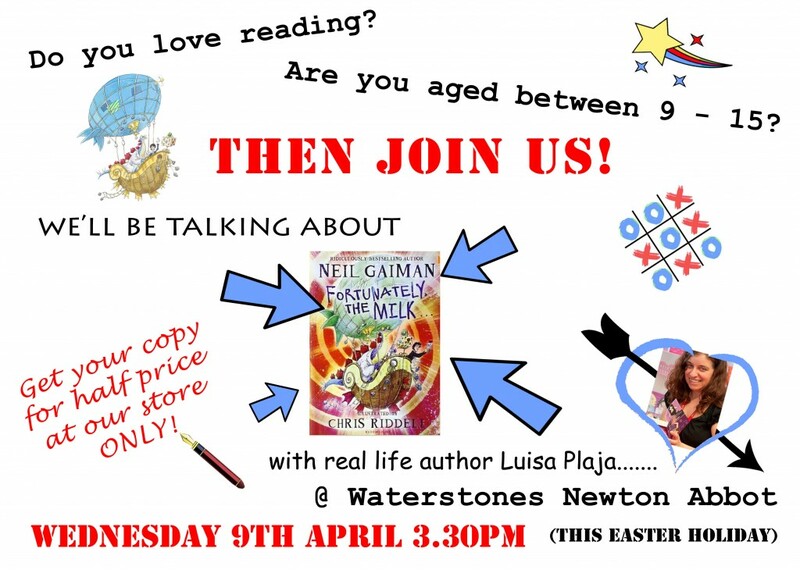 Join us on Wednesday 9th April from 3.30pm.